Anyway. Guys, you want to make this. Even if it’s hot outside. Trust me. It’s good. I ate it for lunch after our “cold” day when it was hot out and I survived. 1 bunch of rainbow swiss chard, stalks and leaves separated. Cut stalks into 1 inch pieces and break leaves up into 2 inch pieces. It doesn’t need to be exact. Make sure to wash the chard to get rid of the grit! In a Dutch oven or big pot, heat up some evoo and saute your onion over medium heat for 3-5 minutes. Toss in the garlic for about a minute. Add the tomatoes. I take them out of the can with my hand and smush them between my fingers to break them up. This is fun! It’s like being a kid again! Add the thyme. If you’re using fresh, make sure to take the leaves off the sprigs and discard the sprig. Cook for about 5 minutes. 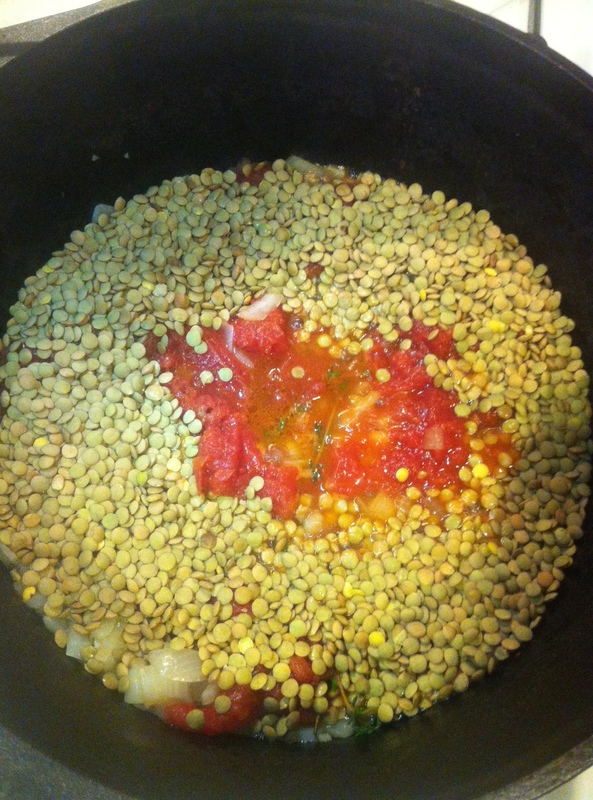 Add the lentils and water. Bring to a boil and lower heat. Add some coarse salt. 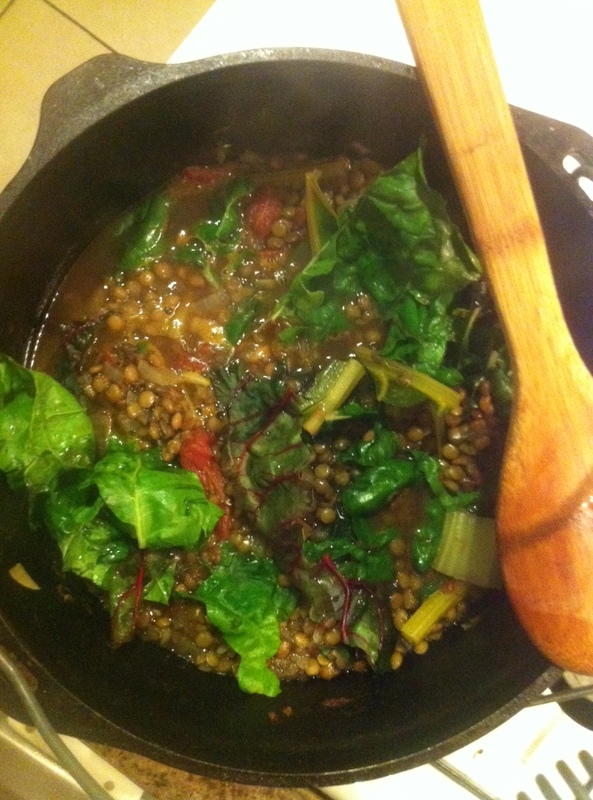 Simmer for about 20 minutes or until lentils become chewy. 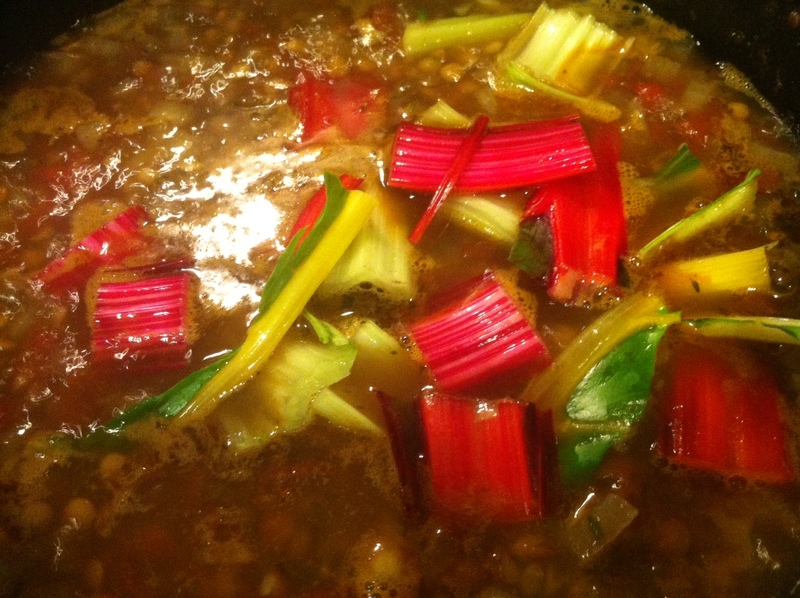 Add the chard stalks first. These take longer to cook than the leaves. Cook for about 5-8 minutes. Just taste one and see how tough it is. You don’t want it to be mushy, it should have a light crunch. Stir in the chard leaves. These should wilt quickly, in about a minute or so. 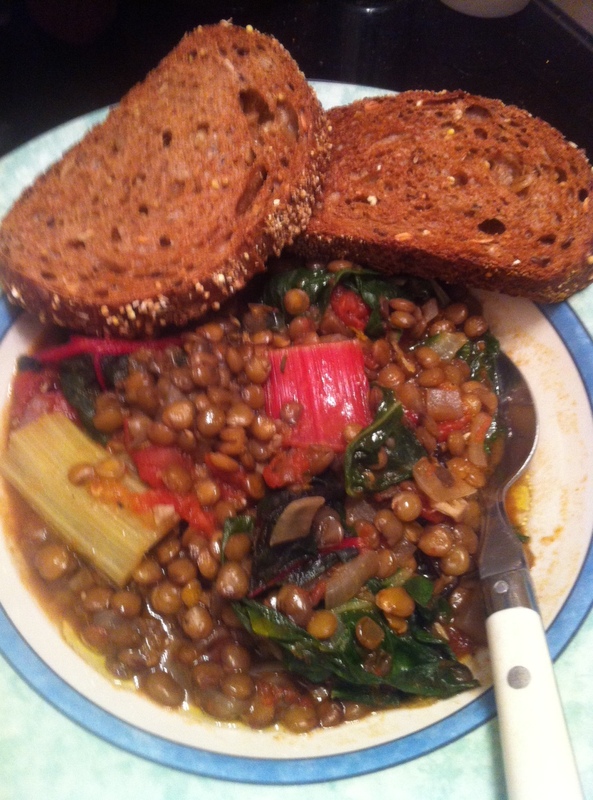 At this point your lentils should be just about done. If not, let everything simmer for a little while longer until it is soft enough. Add the fresh lemon juice. When I serve it I like to add a little fresh olive oil, also. Some grated Parmigiano would taste great on this as well. Serve with bread (optional). Glad to have you!! Make sure to keep visiting! Thanks!